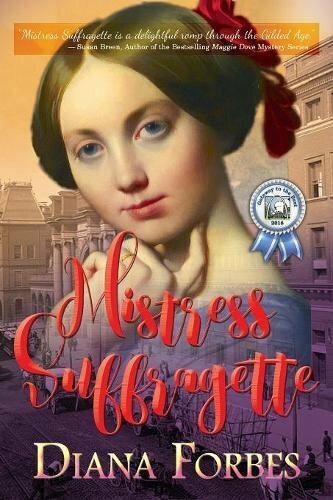 Article first published as Interview: Diana Forbes, Author of ‘Mistress Suffragette’ on Blogcritics. Diana Forbes is a 9th generation American, with ancestors on both sides of the Civil War. Diana Forbes lives and writes in Manhattan. When she is not cribbing chapters, Diana Forbes loves to explore the buildings where her 19th Century American ancestors lived, loved, survived and thrived. She is passionate about vintage clothing, antique furniture, ancestry, and vows to master the quadrille in her lifetime. Diana Forbes is the author of New York Gilded Age historical fiction. Welcome, Diana and thank you for being with us today! Why don’t you start by telling our readers about your journey to becoming a published author? I had a story I knew I wanted to tell, but I knew I needed help in how to relay it. I started taking novel writing classes here in NYC and just kept taking them. The classes provided many deadlines—a great thing for an aspiring author. I would get the feedback from my classmates and revise and revise. Eventually I had a first draft and then I revised that a few times! What is Mistress Suffragette about? The story is about a young, sheltered woman who gets drafted into the Suffrage Movement – almost by accident. She has a unique talent that makes her attractive to the Movement, which allows her to be paid. In the meantime, her love life is a complete disaster. One of the men she becomes involved with is quite dangerous, and he threatens to unravel everything she’s fighting for. Tell us about your protagonist. What motivates Penelope Stanton? Penelope looked forward to living a traditional life, including marriage and children. That life is whisked away from her due to her father’s financial travails. Now she needs to find an alternate path but she has no idea how to go about that. Her quest is a search for independence. She thinks she is looking for love, but she needs to find and assert her own selfhood. How do you relate to Penelope on a personal level? The novel is about change and one’s ability to cope with unforeseen circumstances. Penelope does not have a strong support system, as her parents always seem to urge her to do what conflicts with her aspirations. Even though the book takes place in the late nineteenth century, I was aiming to highlight some of the themes many women experience today. How extensive was the research required for this story? Tell us a bit about it. The research was extensive! I had letters from my 19th century ancestors, which I read over many times. I also had photographs that had been handed down in my family. Beyond that, I made it my personal mission to visit each setting in the novel. If the building still exists today, I visited it and took photos and notes. I went to some fascinating historical re-enactments as well. Beyond that, I read about fifty books – both nonfiction and fiction—about the time period. I found old newspaper clippings as well, researched ancestry records, and in some cases, hunted down menus and other relics from the period so that the setting would feel authentic. I want my writing to resonate with readers. In some of my writing classes, some of the other students would say things, such as “Gosh, it was just as hard to find a man back then as it is today.” Or, “I never realized how tough it was for those women then.” Then I would feel as if my writing had reached its audience. I roll into my office at 9 a.m. I write for four hours. Then I try to think of ways to promote Mistress Suffragette for three hours. And then, I write in the late afternoon again. I’m always toggling between writing and promotion, and more writing. What can you share with us about your publishing experience? It’s been a huge learning experience for me. I researched and wrote the novel over a five-year period. In year three, I searched for and found an agent. Every piece of feedback I received be it from writers, readers, my agent, or editors I took into account because I knew I was just a newbie author. So, I revised the novel a lot. What’s next? Is there another novel in your future? I certainly hope so! I am on draft six of the sequel – probably a few dozen drafts away from completion, but well on the road to the follow up book. And, I see this as a trilogy. What is the best piece of advice you ever received, about writing, or about life in general? Each rejection that a writer receives is a badge of honor. You can’t be a writer without facing some rejection. So when you receive a rejection, it’s time to double down and get the work out there again. What advice can you give aspiring writers of historical fiction/romance? People always say to “write what you know.” But that is pretty limiting! Write what you feel. Write what you want to know, or want to understand better. Edith Wharton, Charlotte Bronte, Tolstoy, and F. Scott Fitzgerald. I found myself rereading Jane Eyre this morning, for example. I enjoyed Gone Girl a few years back. Where can readers connect with you on social media to learn more about you and Mistress Suffragette? I try to put some of my own passions into the story. I think doing so makes the work more tangible.